Thanks to Crazy Dog T Shirts for providing me witha free shirt to review! I did a review for Crazy dog T shirts and Nacho Mama Tee's, I am also doing a giveaway for a free T shirt on Crazy Dog Tshirts The winner will get to pick any shirt of there choice. My Review.. From Crazy Dog Tshirts I chose the "that's how I roll" tshirt. I was so impressed with it, because it was super soft and really comfortable. I wore it all day today and even though it was over 80 degrees out I wasn't overly hot in the shirt because it wasn't thick like a sweater. I also went out to go play miniature golf today and someone complimented on my shirt saying "your shirt is funny" which made me really proud to wear it! Sorry I couldn't get a picture of me wearing the shirt, my grandpa is in Tampa right now and he has the camera with him, but I'll upload one later. 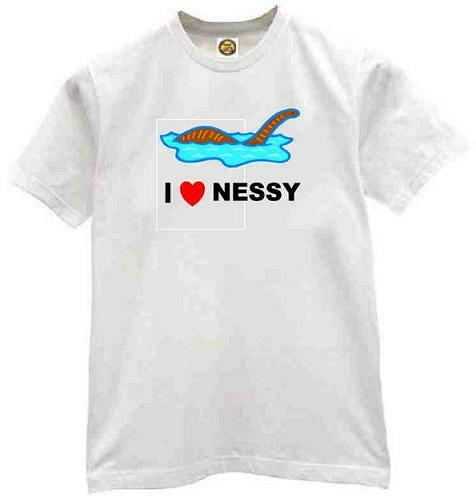 And Then for my review of Nacho Mama tees I got the I ♥ Nessy T shirt, Which I also love because it too was comftorable and cool. I also love my Nacho Mama Tee because, I am a believer in Nessy and I think it is a great shirt to let everyone know I believe. I get to giveaway 1 Tshirt of the winners choice to the winner. The Contest will run from Today (March 25th) until April 11th, 2010. For you MANDATORY entry please visit Crazy Dog Tshirts and let me know what shirt you would pick if chosen as the winner. Thats it. Good luck to everyone, The giveaway will end at 11:59 on April 11th, 2010. Disclosure: I was provided with the review products. I would choose the Im On a Boat t-shirt. It's cute and me and my husband goes out in the boat often. This would be the perfect shirt for this. I would like the Dunder Mifflen Paper Co T shirt. We are big "The Office" fans. I read your Justin Bieber review. He sounds like a really great guy. Welcome to almost not a teen. It only gets better from here LOL! Thanks so much for dropping by and following my blog! Following you back, cheers!! I would pick the "sick of my job" T shirt. I'd pick the 1up shirt, of course. im following you via google connect. i follow you on twitter, look for icitea. Ah, they don't allow for comment editing. I would pick "choose your weapon". I follow crazy dog t-shirts on twitter. I entered your skoy cloth giveaway. I follow Crazy Dog T Shirts on twitter. I would choose the "Nunchucks Don't Kill People...Ninjas Do" shirt! I entered your Snorg Tees giveaway. I like the Dunder Mifflin t-shirt. I like the Smore Marshmallow shirt best. I would choose the Dunder Mifflin shirt if I were the winner. I choose the "Choose your weapon shirt" for women. I entered your Out of the Box Games givaway.